Encourage children to blend letters and experiment with sounds to form simple CV and CVC words. Have fun putting together VC (vowel,consonant) and CVC (consonant, vowel, consonant) words with these Letters & Sounds Phase Two Reading Rods. The colourful rods securely fit together, from left to right, to encourage the blending of letters and experiment with sounds. 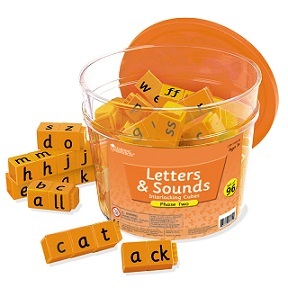 Includes 96 interlocking cubes in a handy bucket - four sets of each letter/phoneme. An Activity Guide is included for useful tips and ideas.